I kind of like this Sankey diagram, because it is simple, colorful, and even though I don’t speak Eesti, I more or less get the meaning of it. 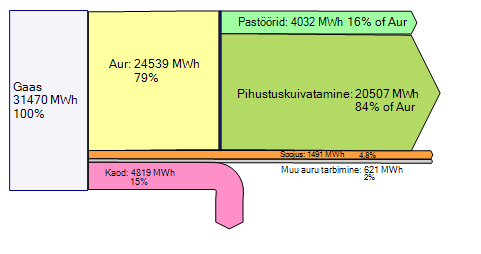 However, have a look at the gray flow labeled “Muu auru tarbimine” which supposedly represents 2% of the overall energy. Shouldn’t it be much thinner, compared to the other flows? I think this ‘not-to-scale’ representation is owed to the fact that in a diagram set up with a conventional drawing tool (is it Power Point they used?) would be very hard to draw and the label couldn’t be placed inside. So they decided to make it “small” but at the same time “lying” with this diagram. It is also quite funky how the purple arrow for “Kaod” has an arrow line pretty much to scale, but the arrow head is much fatter! Ah well, and the percentage values don’t add up to 100% and the percentage values for the green flows (“Pasöörid” and “Pihustuskuivatamine” – I love that word!) are percentiles of the yellow “Aur” flow in contrast to the other percent indications. Here is the same Sankey diagram but with the values to scale, automatically created with a Sankey diagram software. I have adjusted the percentiles in accordance with the absolute values given.